Reprint of LEC #198, 19th Series, V. 2 in 1949. 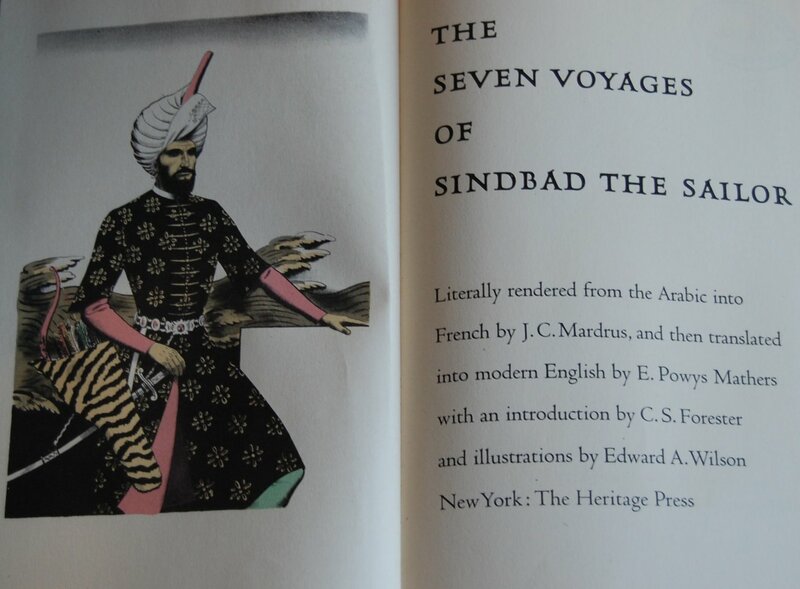 Front Binding – Today’s book is The Seven Voyages of Sindbad the Sailor, a collection of the folktales of the titular protagonist. These tales hail from the Middle East, featuring the supernatural and the sensational. No single author is credited with these stories, but they have been around for a very long time, and it’s nice to see them in such a nice edition. Edward A. Wilson, a frequent artistic contributor, stepped in to provide his touch to this book, and he’s a really good fit, I’d say. 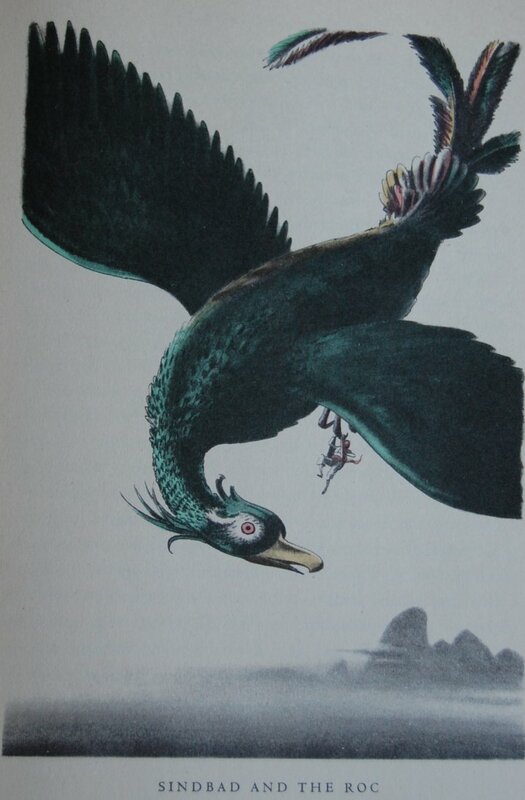 I like Wilson’s work in the more fantastical realm; it works well with his bold color palette and his gentle linework. His LEC/Heritage bibliography can be found here. I can’t go into thorough design notes, as I have no Sandglass. Sorry! Title Page – C.S. Forester, author of the Horatio Hornblower series of novels, provides the introduction. Two translators reworked the text for this edition: J.C. Mardrus, who converted the original Arabic texts into French, and E. Powys Mathers, who took Mardrus’ French and worked it into modern English. Page 43 – …to full-page ones. Lovely work. There’s also some uncolored sketches in the text. 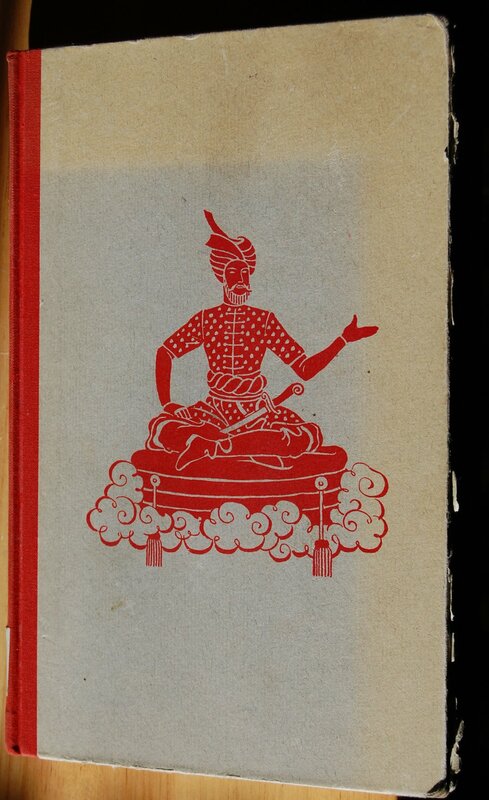 Personal Notes – The photos came from a library copy, but I acquired my own Heritage book from Liz shortly thereafter. I’ve also read the work, and it’s pretty entertaining! 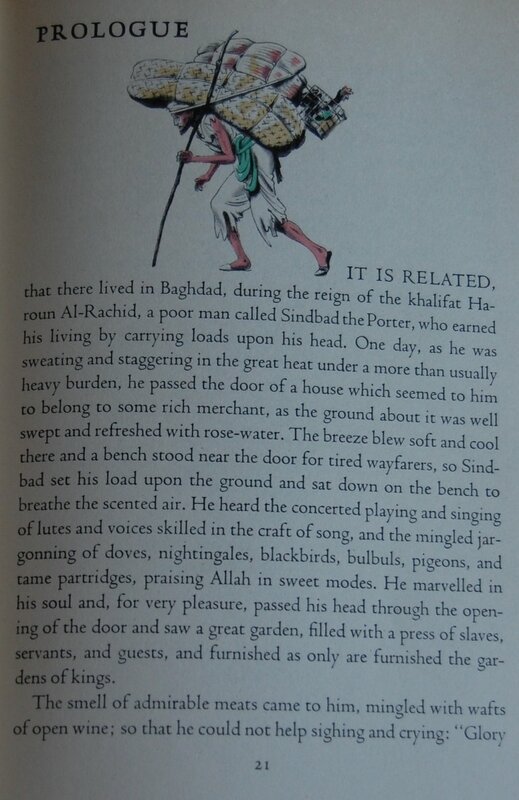 You are currently reading Heritage Press – The Seven Voyages of Sindbad the Sailor (1949) at The George Macy Imagery.